Purple Essentials - Natural Skin Care for a pure and simple life! 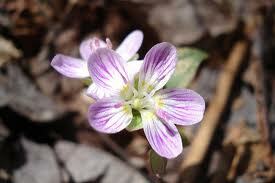 : Spring skin; Ready-Set-Bloom! Taking inventory of your body after it has been tucked away and bundled up all Winter long, can be an eye-opening experience. Once we acknowledge our dry - flaky - pale skin, unattended body hair and callused feet - baring our limbs and getting ready for our skin revealing wardrobe, can feel overwhelming. Take a few simple steps and you can enjoy silky, smooth and radiant skin, just in time for your warm weather reveal. Exfoliation - Remove the oldest dead skin cells on the skin's outermost surface. Exfoliating once or twice a week is usually enough to achieve improved texture and smoother skin; however, people with oily skin should exfoliate more often than those with dry skin. Moisturizing - Apply skin nourishing emollients to the external layers of the skin, to aid the skin in feeling softer and more pliable. This helps to increase the skin's moisture content by reducing evaporation. Moisturize daily, preferably after bathing (while skin is still damp) to maximize moisture in the skin. Protection - Limit sun exposure. Wear a sunscreen and avoid being in the sun through the peak-damage times (usually 10 a.m. until 4 p.m. in the northern hemisphere). Using skin care products that offer ultraviolet protection is one of the best ways to help keep your skin looking and feeling youthful and fresh. Use sunscreen SPF 30+ every day and reapply regularly whenever you're outdoors for extended periods. You can also cover skin by wearing long-sleeved shirts, pants, and wide-brimmed hats, when outdoors. Do you have red or white bumps on your arms, legs or buttocks that look similar to goose bumps? This can be due to keratosis pilaris, a genetic condition that causes extra skin cells to build up around individual hair follicles, giving you a bumpy texture and a polka-dotted appearance. Tip: Application of a skin nourishing daily moisturizer can help to soften the bumps and use of an exfoliating body scrub or polish when bathing (1-2 times per week) can help to reduce the bumps even more. 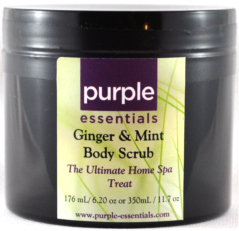 (Purple Essentials Whipped Body Creme and Body Scrubs help to moisturize and exfoliate with pure and simple, skin nourishing ingredients). Do your knees and elbows resemble a dry, ashy desert area? Many people suffer from dry, ashy skin on their limb joints. It can be helped with exfoliation and deep moisturizing. Use an exfoliating scrub 1-2 times per week, when bathing, and follow with a deep moisturizer. Tip: Before going to bed at night, apply a nourishing body butter (Purple Essentials Mango Body Butter works well) to the effected areas. Cut the toe area off of an old (clean) cotton sock - shimmy the remaining band of the sock over the body buttered area, to keep the Body Butter on your skin and off of your clothes and sheets. Remove in the morning. Do your feet make that "scratchy noise" when they slide against the sheets? Before you break out the sandals, you may want to book yourself a pedicure or do one at home. Pay close attention to your heels and toes. Are they dry, callused, even cracked? Once again, the key to getting them silky-smooth, is exfoliating and moisturizing. Tip: Add 3 cups of warm milk and one cup of honey to a large basin, stir until blended and soak your feet for 25 minutes, massaging the liquid into your skin. Use a handful of a sea salt based body scrub to exfoliate dead, dry skin off of the feet. Rinse with warm water and gently push cuticles back to the nail bed with the back of your thumb nail, and pat dry. For a deeply moisturizing treatment apply a layer of thick body cream or body butter to feet and cover with clean, cotton socks, sleep and remove in the morning. (works well for hands too). Have you neglected your body hair for weeks, even months, through the Winter? It might be time for substantial de-fuzzing of areas that will soon see the sun. Tip: Plan to do a thorough exfoliation 2 days prior to having any hair removal treatments performed (ie. waxing, sugaring etc). Your aim is to loosen and remove dead skin cells, which will help to make hair removal easier, by lifting small hairs and removing dry skin. A great place to visit for de-fuzzing (sugaring or waxing) Solace Esthetics (Stacia Power). Interesting fact: hair follicles begin to form during the tenth week of pregnancy when the fetus is about the size of a peanut. By week 22, there are approximately five million hair follicles all over the body, and not a single additional follicle will ever be produced from that point forward. Looking a little pale? A faux-tan can warm up your pasty colour. Tip: Be sure to exfoliate 2 days prior to faux-tanning, to achieve even coverage, colour and avoid streaks. You can also use a natural bronzer and mineral makeup to create a sun-kissed glow. For an all natural, organic sunless spray tanning session. See Jada Lombard at The Green Bath & Beauty Company. *Remember that you will still need to protect your golden skin with SPF 30+.